During the month of August, Argyle Feed and Hardware is having a Pet Food Promotion. 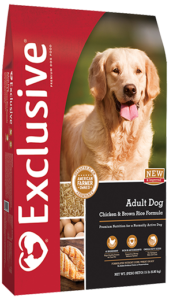 This Pet Food Promotion is For New Customers Only: Just bring in an empty bag of a competitors pet food (dog or cat food) and we’ll REPLACE it with a like size bag of PMI Exclusive, Red Flannel or Infinia pet food. That’s a FREE bag of pet food. One per customer per month. This pet food promotion is good August 1-31, 2017. Whether your pet is a companion or a performer, PMI Nutrition® is dedicated to building products that optimize their important purpose in life. The exceptional ingredients in Exclusive® Dog Food were chosen to give today’s dogs what they’ve always liked, and what they’ve always needed: real meat and real protein. Make the switch today and take advantage of this great promotion. Once your dog tastes the PMI Nutrition Brand difference, there will be no going back. So stop by the store and get your FREE bag of pet food today! This entry was posted on Thursday, July 20th, 2017 at 4:09 am	and is filed under Cat, Dog, News & Updates, Specials. You can follow any responses to this entry through the RSS 2.0 feed. Both comments and pings are currently closed.